almost 9 at night, when Justin Holden pulled the icy pizza box from the refrigerator at the Brookville Supermarket in Washington, D.C.
A close relative had recently had a heart attack, and in the back of his mind there was this idea stalking him: If he put too much salt in his body, it would eventually kill him. 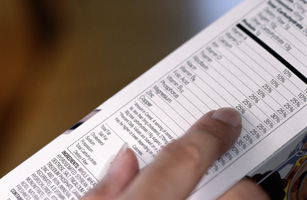 For this reason the information in the label wasn’t exactly soothing: 1,110 milligrams of sodium seemed like a lot. But there was even worse-sounding stuff at the bottom of the label. Words like “diglyceride,” with a string of letters that clearly had no business sitting next to each other. It suggested that something deeply unnatural was sitting inside the box. He tucked the pizza under his arm, and headed one aisle over for a sports drink. Who among us has not had a moment like this? That intimate tete-a-tete with the nutrition label, searching out salt, sugar, fat, trying to discern: How will you affect me? Are you good? Or are you bad? Here’s the thing you probably haven’t stopped to consider: how the label itself is affecting you. “Labels are not just labels; they evoke a set of beliefs,” says Alia Crum, a clinical psychologist who does research at the Columbia Business School in New York. The other half was put into bottles that were labeled as containing an incredibly rich treat called Indulgence. According to the label, Indulgence had all kinds of things that wouldn’t benefit your upper thighs — including enough sugar and fat to account for 620 calories. In truth, the shakes had 300 calories each. 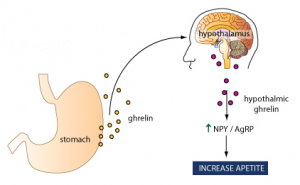 Ghrelin is a hormone secreted in the gut. People in the medical profession call it the hunger hormone. When ghrelin levels in the stomach rise, that signals the brain that it’s time to seek out food. On the other hand, if you only have a small salad, your ghrelin levels don’t drop that much, and metabolism doesn’t get triggered in the same way. But that’s not what Crum found in her milkshake study. I don’t think we’ve given enough credit to the role of our beliefs in determining our physiology, our reality. “The ghrelin levels dropped about three times more when people were consuming the indulgent shake (or thought they were consuming the indulgent shake),” she says, compared to the people who drank the sensible shake (or thought that’s what they were drinking). Does that mean the facts don’t matter, that it’s what we think of the facts that matters? “I don’t think I would go that far yet,” Crum says. More tests need to be done, she says, to figure out exactly how much influence comes from food and mindset. But she does think the usual metabolic model — calories in and calories out — might need some rethinking, because it doesn’t account in any way for our beliefs about our food. As for Holden, after he retrieved his sports drink, he picked up a salad, then carried his items to the cashier and put them down on the conveyor belt. The liquid of his sports drink almost glowed under the lights of the store as the cashier rang him up. Holden told the man he didn’t want a bag. He carried his pizza out into the night. Within an hour, the pizza and drink would be in his stomach, mingling there with a set of beliefs that he got from the back of a box. This experiment is a wonderful example of the Placebo Effect and the mind’s power over the body. As an EFT Practitioner I work with this mind/body connection to help people with their weight and chronic illness problems. Be sure to get my free article: The Head Game of Weight Loss which explains more about how the mind can make your body hold onto weight, pain and other physical ailments. Please post your comments below about mind/body experiences you may have had. 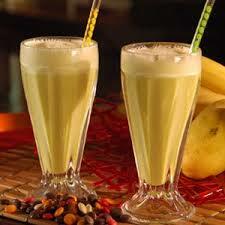 Previous PostLet’s Make Some Smoothies!